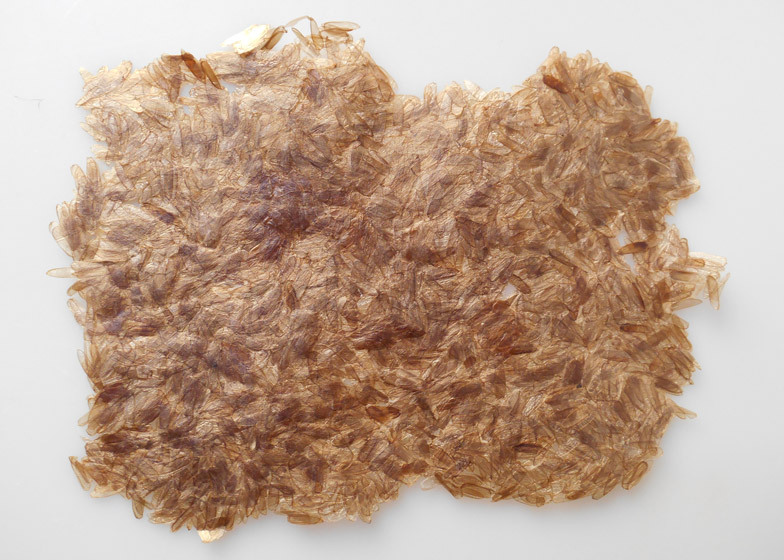 Dutch Design Week 2013: design graduate Aagje Hoekstra has developed a plastic made of pressed insect shells. Aagje Hoekstra took the armour of dead Darkling Beetles, which grow from larvae known as mealworms, to create the Coleoptera bioplastic that she showed at the Klokgebouw building during Dutch Design Week earlier this month. "In the Netherlands mealworms are bred for the animal food industry but they transform into beetles," Hoekstra told Dezeen at the show in Eindhoven. "After laying its eggs the beetle dies, so insect farms in the Netherlands are throwing away 30 kilograms of dead beetles every week." Before the beetles are disposed of, Hoekstra peels them so she is left with just the shells, which are made of a natural polymer called chitin that is also found in crab and lobster shells. She uses a chemical process to transform the chitin into chitosan, which bonds better due to a variation in the molecular composition. The material is then heat-pressed to create a plastic, with the oval-shaped shells still visible. "I wanted to keep the structure of the beetle in the plastic so you know where it has come from," said Hoekstra. She claims the plastic is waterproof and heat resistant up to 200 degrees centigrade. Items Hoekstra has already produced from the material include jewellery and decorative pieces, but she hopes to develop the plastic for more practical applications. "In the future I want to make functional products such as plastic spoons and cups," she said. Hoekstra recently graduated from Utrecht School of Arts in the Netherlands. She is one of several graduates experimenting with ways to make plastics from animal products that are normally thrown away, with other examples including electronic products made of crab shells and goggles made from fish scales.